NotaryGadget is a super easy accounting software for notaries and signing agents. It makes just about everything you do easier - sending invoices, tracking payments, tracking mileage, tracking notarial acts, managing your calendar, tracking your expenses, and helping you with your taxes. Save $1000's on your taxes. NotaryGadget tracks your notarial acts on each signing, which can easily save you $1000's on your taxes! Click here to learn more. Did you know that the fees you collect for performing notarial acts are not subject to Federal Self Employment Tax (15.3%), whereas the rest or your net income is? And if you're not reporting this amount to your accountant (or tax preparer), then you could be throwing away $1000's of dollars each year. EXAMPLE: Let's say that on average you perform 2 notarial acts per signing and the maximum amount you can charge in your state is $7 per notarial act - it's different for each state. Now let's also assume you do 8 signings per month on average. That comes to $1,344 of notarial fees per year, which means $1,344 of your net income that would normally be subject to Federal self employment tax at 15.3% would not be. If you were tracking and reporting these fees you would save $205 every year ($1,344 x 15.3%). It's super easy to track them with NotaryGadget. It even reports them separately witha special note on your Tax Report so your accountant or tax preparer figures them into your tax return (you'd be surprised on how many don't even know this exists). The minute you enter a signing into NotaryGadget, it automatically creates a PDF invoice for you. Just click the "send" button and it's on the way to your customer...you don't even have to open your email. And you can send monthly or weekly invoices too! If you're a seasoned notary, then you know how much work it can be to constantly keep track of who owes you money. With NotaryGadget it's simple. It instantly shows you which invoices haven't been paid and how long it's been since you did the signing. NotaryGadget automatically calculates driving directions, mileage, drive time, and even records the amount you can deduct on your taxes for each signing. 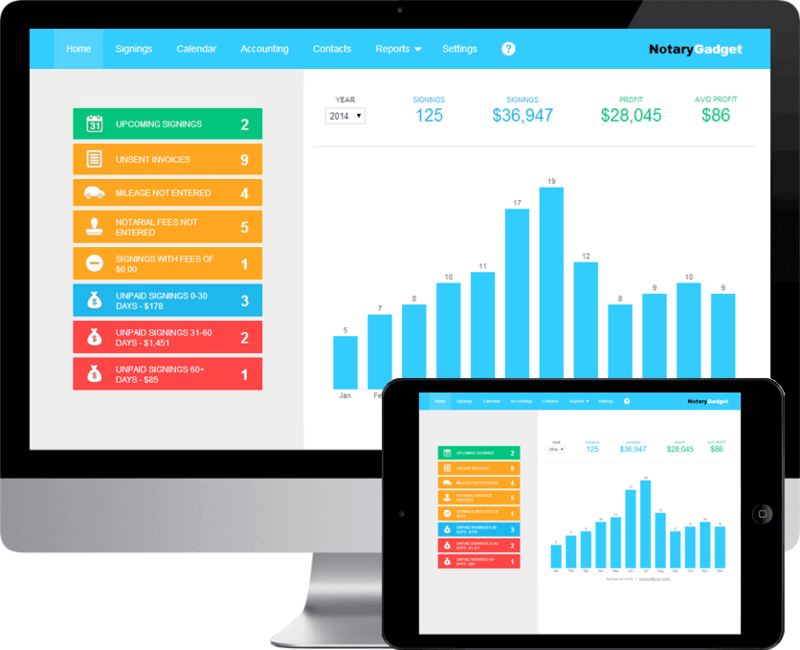 NotaryGadget makes is super easy to track all your business expenses. It even let's you track the expenses on each signing so you can see how much profit you're really making on each customer. NotaryGadget automatically adds your signings to your Google Calendar and your smart phone. You can even set it up to send you email and text message reminders before each signing. NotaryGadget instantly generates the report you need to do your taxes. It breaks down all your income, expenses, and notarial fees exactly the way an accountant (or tax preparer) needs to see it to do your taxes. NotaryGadget works on all versions of Windows, Macs, iphones, androids, windows phones, tablets, and just about any other device with a browser! Plus, it's cloud based so there's no software to install and your data is automatically backed up every night. We take your privacy and your information serious. We use the latest bank level security protocols and our server is automatically backed up every night. NotaryGadget is recommended by the National Notary Association, 1000's of notaries all over the U.S., and so many notary organizations. © NotaryGadget, LLC. All rights reserved.